ON A SOFT green planet, a smiling baby was born in an orchard resplendent with every kind of fruit in the universe. The baby’s parents called her Tanika, and Tanika spent her days roaming the warm wet ground on hands and knees. Spotting a clump of gulberries off in the distance, she’d crawl after it and crush the sweet fruit in her mouth, red juice staining her brown chin and neck. A muavo would fall fatly from the high crown of the muavo tree, and she’d savor its golden tang. Each day revealed new wonders—bushapples, creamy labanas, the nutty crunch of the brown shrombart. The orchard’s fruit sparkled in the dew and sun like thousands of living moist jewels against the green fragrance of cushioning leaves. As her eyes grew stronger Tanika lifted her gaze. The opulent branches above her hung heavy with fruits she’d never dreamed of, globular and glistening. Tanika’s mother and father wandered the orchard too, sometimes, and she watched them reach out easily and take a shining cluster here, a single green satinplum there. She’d watch them eat and imagine being tall enough to roam and reach so freely as they. Sometimes one of them would bend down and give Tanika one of those fruits from up there in the moving leaves. Fresh from the branches, it intoxicated her, and her desire to know and taste all the fruits of the orchard so consumed her that she began to long for the day she could reach that far. Her longing strengthened her appetite, and the fruit strengthened her legs, and one day Tanika crawled to the base of a mysterious bush at the edge of the stream that watered the orchard. She leaned carefully forward and braced her arms as she positioned her feet. Unsteadily she rose and groped for the shrub’s pale fruit. Tugging knocked her off balance and she sat down hard in an overripe muavo, but she barely noticed the fruit squishing under her thighs: in her hands she grasped a fruit thin-skinned and silver, fresh and new. She pressed it to her nose and face before she let her teeth puncture it. No sooner had she tossed the smooth pit into the stream, than she heard a rustling behind her. A jolly bespectacled face grinned down at her. Tanika’s happiness unfurled like a sail. She could hardly believe her good luck. Not only had she just picked and eaten her first bush fruit, but here was a man she didn’t even know offering to show her how to reach the prism of treats high above her head. Tanika was so overcome with joy that she immediately rose to her feet again, and plucked another of the small moonish fruits. The jolly stranger slapped the fruit from Tanika’s wrist. Stunned, she fell again and watched her prize roll into the stream. “Oh dear,” said the man, “You’ve already picked up some bad habits. That may make things difficult.” The slapping hand now took Tanika’s and pulled her up. Holding on this way, Tanika stumbled along behind the stranger. She wanted to ask questions, like, “Why didn’t you just show me how to pick those berries hanging above the bush where I was?” But she kept her mouth shut. If she was going off to pick the high fruit, she guessed it didn’t matter where, or that she’d sacrificed her one beautiful moonfruit. Maybe they were going to a special tree melting with juicing fruits, branches bent almost to the ground, low enough for her outstretched fingers. Yes! That must be it. Excitement renewed, she moved her legs faster. The stranger grinned and squeezed her hand. Soon Tanika saw the biggest, greyest thing she’d ever laid eyes on. In quiet fascination she tripped along as they stepped off the spongy humus of the orchard floor onto a smooth sidewalk. “Here we are!” beamed the guide. They entered the building, full of odd smells and noises. They passed through a pair of heavy black doors, and the man pushed Tanika into a loud, complicated room full of talking children and several adults. She looked at the children, some sitting on the floor, some crawling about or walking. All of them had trays or plates in front of them heaping with odd mushy lumps of various colors. Also, some of the children were busy coloring simple pictures of fruits, and some wore pins and tags on their shirts displaying little plastic pears and mistbulbs. Baffled, Tanika tried to figure out what the children were doing in such a dark, fruitless place, what the lumpy stuff was, and above all, why her guide had stopped here on their way to the bountiful tree. Tanika felt confused. She didn’t see what this place could have to do with picking gulberries, and at the moment she was particularly hungry for more of that shining moonfruit. But she had no time to think. The slick-hand woman put Tanika on a cold chair at a table. “Here,” she said, and nudged a box of crayons and a black outline of a plum at her. “Today you will color this, and it will help you get ready for eating tomorrow.” Tanika started to feel foolish. She’d never guessed that learning to pick fruit would be so complicated. She colored the plum with all the colors in the box, trying in vain to make it round and enticing like the fruits of the orchard. The rest of the day passed in a daze. Tanika was made to color more of the pictures, and to her disgust most of the children ate the formless mush on the plates in front of them. Some of the fat and greasy children asked for more and stuffed themselves. Whenever this happened, the adults ran in and put gold stars all over the kid’s arms and face. Many things happened—children fought, napped, sat quietly fidgeting with the stuff. Finally, the jolly man took Tanika’s hand and led her out of the dark building. As her bare feet met the orchard grass, she caught the scent of ripe labana. She asked the stranger if he would get one for her, but he merely laughed. Tanika was far too confused to put any of her questions into words. By the time they arrived at the tree where Tanika slept with her parents, the evening light had turned the leaves to bronze, and she was exhausted. Too tired to look for fruit, she fell asleep and dreamed fitfully. In the morning her mind was clear. She still wanted to reach the high fruit, but she did not want to go back to the noisy smelly dark cafeteria. She could already reach the bushfruit; maybe in time she’d grasp the high fruit too. But when the spectacled person arrived, he told her that she’d never reach the trees without many years in the cafeteria. He explained it—”You can’t reach them now, can you?” and “Your parents can reach them. That’s because they went to the cafeteria. I can reach them, because I went to the cafeteria.” Tanika had no time to think this through, because he’d pulled her to her feet again and they were off. She hadn’t had time to find breakfast, and her stomach rumbled painfully. The tall lady laughed. “Well, well, well! Aren’t we cute! Tree fruit! Before you’re ready for tree fruit, you have to prepare!” She disappeared behind a curtain and returned carrying a tray with a scoop of greenish stuff. Tanika jerked back. She looked around wildly for an escape route. Out of the corner of her eye she saw a boy watching with soft dark quiet eyes. The lady grabbed her hand. “Don’t be afraid, Tanika,” she laughed. “How will you ever work up to eating tree fruit if you can’t handle plate fruit?” She put the tray on the table, and took the metal thing, spooning up a piece of the stuff and holding it in front of the small girl. Tanika pushed the spoon away violently. Then she put her head down on the table and cried. The lady’s voice changed. “So you’re going to be a tough one, Tanika? Just remember, you’re only hurting yourself when you refuse to eat. If you want to succeed, you’d better do as we ask.” She walked away. Hours later, Tanika had been the apple in “Velcro the Stem on the Apple,” and had drawn a muavo tree and listened to an older student explain what fruits contained vitamins P, Q, and Z. Apparently she had done all these things right, because the lady came back and put more green and gold stars on her hands and cheeks. Some of the children looked at her angrily, though, so perhaps she’d done something wrong. At this point a man rang a little bell. Immediately all the children sat down at the tables and folded their hands neatly. A girl grabbed Tanika’s hand and shoved her onto a chair. Then six children walked into the room carrying stacks of trays. They put one in front of each child, and Tanika saw that each tray contained five purple and blue wafers. “Yum!” said the girl next to Tanika, “Violetberry cakes!” Tanika jumped. She’d seen her parents eat violetberries, and also seen the accompanying ecstasy on their faces. She easily pictured the graceful coniferous trees on which they grew. She picked up a wafer. It was warm, but not with the gentle warmth of the sun. She put it in her mouth. Dry, sandy… she chewed obediently but sadly. This was it? Disappointment sank her stomach and she put the cake down, mentally crossing violetberries off her wishlist forever. In the end Tanika was made to eat the violetberry cake—all five hunks of it— before the spectacled man would lead her out the door. Her stomach throbbed all the way home. That night she crawled into her mother’s arms and sobbed. Her mother rocked her, then whispered something to Tanika’s father. He disappeared, and returned a minute later with an armload of tiny, glowing violetberries. Her father dangled them teasingly above her lips, but Tanika only cried harder. The berries’ fragrance, though delicate and sweet, clashed with her distended heavy stomach. She was far too full, and it was violetberries’ fault. Both parents teased and offered, but they finally gave up. Her mother laid Tanika down to rest alone, and the two adults stood whispering while the moon rose, worry in their voices. At the cafeteria the next day the adults met Tanika with an unpleasant stare. “You’re making things difficult for yourself,” scolded the woman with slick hands, “Your parents have reported that your attitude at home is not meeting standards for girls your age. You need to eat much more thoroughly.” A girl brought a plate crowded with dried out, wrinkly little fruits. Tanika ate them, tough and tasteless. Her stomach hurt again. After they dissected a preserved bushapple, she ate another tray full of canned gulberry. Then she went back home and slept. Days passed, and months. Tanika ate obediently and earned lots of stars. There was a picture of a bright green tree painted on one of the walls, and when the whole roomful of children ate their food quickly, the adults had them play a game. They taped three or four cut-out paper fruits to the tree, and then the kids were made to take turns jumping or reaching to try to take them. Whoever reached a fruit got to keep it, and also was called a winner and plastered with dozens of gold stars. As he waddled away, a strange inspiration seized Tanika’s brain. She touched her swollen belly and flung the carton away. Out of it tumbled cakes, red mush, hard little biscuits smelling flatly of labanas. When she woke the next morning her stomach rumbled and she got up to look for breakfast. Leaving the clearing, she accidentally kicked a biscuit. Out of habit, she picked it up and almost put it in her mouth, then caught herself and aimed instead for a bush full of gulberries. Furtively she snatched a handful and crushed them to her lips. Sweet and wild, they made her want to sing. “Be sure to eat all your homefood,” said her father, “So you won’t be behind when you go back.” Then his tone of voice changed. “What’s that?” he said. He sprinted off and grabbed up the white carton. 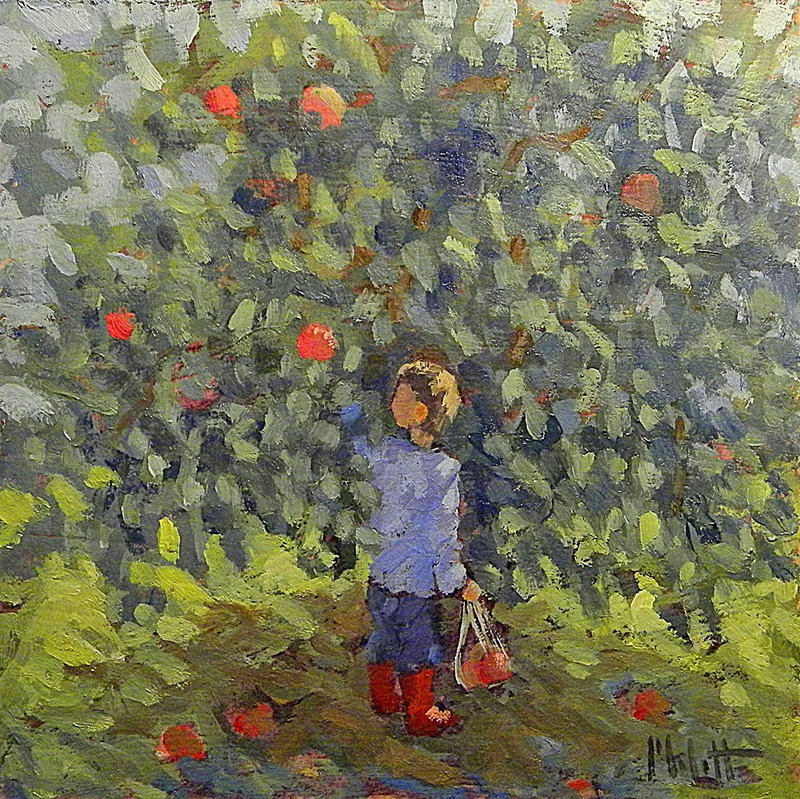 Tanika watched in horror as he searched the orchard floor. A few minutes later he returned with everything— biscuits, cake, mush. The cafeteria opened again and Tanika went back. Every day she ate faster, and gradually stopped resisting, even in her own mind. One day she reached the highest paper fruit on the painted tree. All the adults patted her head and she could barely see her brown skin under all the gold stars. She started walking to the cafeteria every day by herself. The adults started giving her food for the evenings, and usually she’d eat it like they said. One day, walking home, she flung her hands to the sky and they touched, accidentally, a muavo hanging down from its branch. Tanika jumped back. “I can pick it,” she said slowly, “It worked.” She thought for a minute. The cooks had said it would happen, someday, if she ate what they gave her and jumped as high as she could during the tree game. Tanika gracefully severed the muavo from its stem, examined it, and tossed it neatly into a shadow. Had written this in September 2011, when I was volunteering with a small Tibetan school. Boy (A) – A little fat, stout fellow. He is always dressed shabbily, with at least 2 button of his shirt always broken. His boots are always broken. Also he does not do well in the “regular classroom” studies. Barely passes and had also failed in a subject in previous class. Girl (B) – A very sweet girl. When I asked her what was it that she wanted to become, she replied fashion designer. A lover of style, she is always wearing latest designs (to the best she can afford). She adores film stars and other celebrities. Now coming to the answer (translated from tibetan) she wrote for the question – Who is the person that inspires you? Who do you want to be like? I really admire this boy (A). He is so simple and down to earth. After class whenever I see him, he is always busy reading some or the other book. I have never seen him fight, abuse other kids. He always manages to find a little corner for himself and busies himself with reading or writing about something. He never talks bad about anyone and is always smiling and cheering others. Now, I very well know that he is always dressed shabbily unlike other boys who come to class all hip and hop. He also does not do well in the exams and is considered by almost all the teachers as dull and lazy. But surprisingly that does not deter him from reading so many extra books after class. I see in him a person that I so respect. He never tries to gain attention. After seeing him I have realized that it is not the outer appearance that we should seek in a person but his or her inner beauty. I want to become like him – beautiful from inside. After listening to her answer I was so overwhelmed, now realizing why I liked that boy so much. I had made a certain impression of the girl (based on outer appearance), which later I realized was so wrong. “World I do not know. But I do want to take care of my parents. They have done a lot for me. I want to keep them happy. Every single moment”. I had never thought that this could be also a possible answer.